Federal University Lafia, FULAFIA is seeking applications from suitably qualified candidates to apply for the position of the university REGISTRAR. 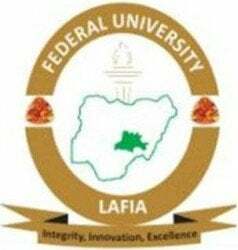 Federal University Lafia was established in February, 2011 with the mandate to increase access and quality of University education in Nigeria. The University which currently has three (3) Faculties and seventeen (17) academic programmes is poised for accelerated expansion of academic activities. The Registrar is the Chief Administrative Officer of the University, responsible to the Vice-Chancellor for the day-to-day administration of the University. The Registrar by virtue of the office is Secretary to the Council, the Senate, Congregation and Convocation. 7. Must have a good working knowledge of current administrative principles, processes and practices. The Registrar shall hold office for a single term of five (5) years only on such terms and conditions as may be specified in the letter of appointment. The remuneration and other conditions of service are as applicable to the post of Registrar in all Federal Universities in Nigeria and as may be determined from time to time by the Federal Government and the Governing Council of the University. ´ Each application, including the candidate’s detailed curriculum vitae duly signed should be made in twenty (20) copies. The curriculum vitae must contain, among other things, the candidate’s full name, age, marital status, educational attainment, State of origin, professional and academic achievements. ´ Each application should include the names and addresses of three (3) referees. Each applicant should request each of his/her referees to forward, direct to the Vice-Chancellor, a confidential report on the candidate’s character, academic and managerial abilities in a properly sealed envelope marked Post of Registrar: Referee’s Report, with name of candidate at the top left hand corner of the envelope.